There have been a number of recent albums worthy of a few comments. 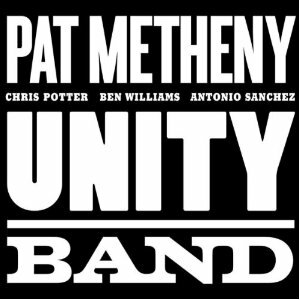 I suspect that Pat Metheny’s “Unity Band” which just came out is likely going to garner a lot of attention; just look at that band. Also recently come out is the Fly trio’s overdue new album “Year of the Snake“. In addition, I’d like to say a word or two about Tom Harrell’s most recent album, the aptly titled “Number Five“, which has been out a few weeks now. Chronologically, Harrell is a good place to begin. “Number Five” is so named because it is the fifth album Tom has put out with this band, which I saw augmented with strings earlier this year. Tom is pretty dependable as both a musician and composer and as I believe I said when I saw him live, I love this band, and I’m glad to see it producing records. While maintaining a working band over a longer period of time has its advantages, it does suffer one potential pitfall in that the albums can start to sound alike as years go by. I found 2008’s “Prana Dance” utterly compelling; last year’s “Time of the Sun” was some how not as exciting. This time round, Tom and the band seem to be trying to mix the sound up just a bit and the result is a very satisfying full album. While the overall band remains the same from the last four albums, here Harrell plays with the line up a bit more than he has in the past. There are, for instance a handful of duets on the album. The album opener, Dizzy Gillespie’s “Blue n Boogie”, is a blazing duet with drummer Jonathan Blake, and “Journey to the Stars”, a duet with pianist Danny Grisset, is one of my favorites on the album. Harrell also gives us a great solo flugelhorn rendition of jazz standard “Star Eyes”. When playing all together, the quintet as a whole delivers exactly as we’ve come to expect it to producing some extremely satisfying music. The package is one that delivers not just some great songs, but a great overall experience. I will admit up front that I have something of a love-hate relationship with Pat Metheny’s music. He is unquestionably one of the most talented guitarists of all time, almost preternaturally so, yet so much of his recent work has really not grabbed me at all. Listening to the opening track on his album “80/81”, ‘two folk songs’, or, for that matter, any track on his 1985 collaboration with Ornette Coleman, is a powerful experience; like it or loathe it, those are albums that can’t be relegated to the background. Another favorite of mine is a sometimes hard to find 1990 live collaboration with Herbie Hancock, Jack Dejohnette and Dave Holland, “Parallel Realities Live“. (There is also an earlier studio album, “Parallel Realities”, but it lacks bass maestro Dave Holland who I think contributes so much to the live collaboration.) Despite these, and other, spectacular albums from the late 80’s and early 90’s, I’ve found it hard to be passionate about Metheny’s recent output. 2007’s “Day Trip” sounded so sterile to me and put me in the awkward position of not particularly enjoying an album with the spectacular rhythm section of Christian McBride on bass and Antonio Sanchez on drums. The Orchestrion project, in which Pat plays solo with a self-designed automated orchestra, was fascinating and produced a surprisingly enjoyable album, given the high concept of the project. And yet, while I was pleasantly surprised to enjoy “Orhestrion” as much as I did, I put the album away after a week or two and have quietly not listened to it since; it just didn’t grab me. On paper, Metheny’s new ‘Unity Band’ seems like the most dynamic band imaginable. How does it stack up? And the Unity band really is dynamic. Metheny is joined by Chris Potter on saxophones and bass clarinet, rising bass star Ben Williams while Antonio Sanchez returns to the drum throne. Certainly an exciting group of musicians and each one does have at least a moment or two to really shine (although, in my book, Sanchez could have been afforded a moment or two more than he got). On that front, you certainly get what’s advertised. Some very skilled solos by some of the most interesting improvisers out there. Yet, I can’t give “Unity Band” my unqualified endorsement, partly because were it not for the presence of Chris Potter this album would sound like every Metheny trio album of the last decade and partly because I think the album gets caught up in its own concept sometimes. Take, for instance, the song “Signals (Orchestrion Sketch)”. For the most part, this is an enjoyable, upbeat Metheny jaunt incorporating the orchestrion automatic orchestra, fun stuff. Yet it begins with three minutes of totally aimless, noisy, avant-mess before the actual song begins. Why? Did they think that at 8 minutes the song itself wasn’t long enough and needed to be padded out? As a fan of even some of the noisiest of avant-garde and free jazz, I can’t help feeling a tinge of pain at how badly it is used here. Or, thankfully less offensively, take the generic finger-picked classical style guitar that opens up the album and the song “New Year”, again acting as an introduction to the song proper. While Metheny may be stretching for the composerly feel that music with movements has, this just falls flat on its face. Finally, we come to the Fly trio, Mark Turner on tenor saxophone, Larry Grenadier on bass and Jeff Ballard on drums, and their new album “Year of the Snake”. In some ways this is the easiest of these albums to review, as it sounds much like Fly’s last outing, the superb “Sky and Country“. Everything that made “Sky and Country” a good listen is back: Turner’s airy tone, Ballard’s active yet never over aggressive drumming, Larry Grenadier, it’s all here. Interspersed throughout the album is a tone poem in five parts called “The Western Lands” that I don’t particularly care about, but most of the album is upbeat, active and exciting. Highlights include the tracks ‘Diorite’ and ‘Kingston’ for showcasing Turner, and the last few minutes of ‘Kingston’ again as a really exciting group effort. By and away my favorite cut, however, is the title track, in particular Larry Grenadier’s solo, which is an example of everything so great about this band. The piano-less trio is not a new medium, indeed Sonny Rollins made it famous in the fifties, but despite how long the format has been around, it remains somewhat unconventional for a group to lack a chordal instrument. While albums will sometimes have tracks on which the keys or guitar doesn’t play (Harrell’s album has a few), it really isn’t that common for working bands to forego chordal instruments altogether without making up for it by increased orchestration. Fleshing out the harmonies of the chord changes without an instrument capable of playing all the notes at once is the fundamental challenge of the chordless small group. Usually, the bassist is working overtime to pick up the slack: that isn’t to say the bassist needs to play more notes than normal, but that it takes a particularly skilled bassist to make everything hang together right. I see the bassist as the real key to the chordless trio. What to do when the bassist takes a solo, though? Here is where Fly really shines. Larry’s solo on “Year of the Snake” is not only itself wonderful, but captured in a moment of full band cooperation, with Mark Turner playing in the background, keeping a sense of lush harmony despite the sparse orchestration and Jeff Ballard playing seamlessly off the rest of the band. Great.